Sound Matters episode #058 features Tom's conversation with perhaps one of the most underrated guitarists in rock music over the past 30+ years. 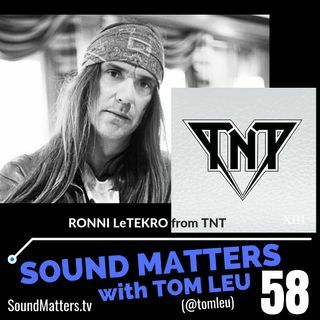 Ronni LeTekro is a founding member of Norway's multi-platinum band, TNT, as well as a prolific solo artist. Ronni is as funny and honest, as he is direct and surprising. Ronni was an absolute pleasure to speak with, and he was sure to throw a few curve balls into this interview for good measure... Enjoy! 07:21 - On Tony Harnell & why release a new TNT album?